Central banks around the world have attempted to manage inflation rates through massive expansions of monetary policy known as QE, or quantitative easing. After struggling with deflation for years, Japan launched a full "Hail Mary" with the most aggressive QE program to date, injecting funds roughly equivalent to Canada's entire economy into their financial system. Did it work? 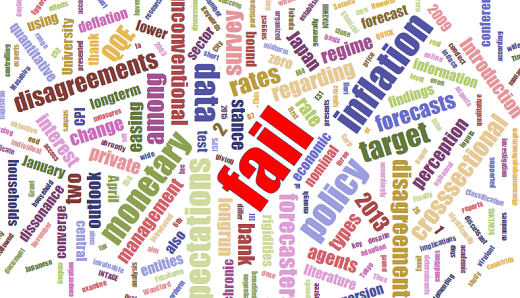 A recent paper published by the Bank of Japan admits their efforts have so far failed as long-term inflation forecasts "fail to converge" to the central bank's target. "[D]espite the adoption of a 2% inflation target in January 2013 and the introduction of an unconventional monetary policy," the report states, "long-term forecasts fail to converge to the target level." The word "fail" shows up quite often in the document for obvious reasons: events aren't unfolding as the "academic literature" said it would. In January 2013, the Bank of Japan introduced an inflation target of 2% followed by quantitative and qualitative monetary easing (QQE) in April 2013. These measures aim at establishing more accommodative monetary conditions, even at the zero lower bound of short-term nominal interest rates, by increasing inflation expectations and lowering real interest rates, which in turn should end chronic deflation. The objective is to manage expectations...because according to academic literature, inducing a policy regime change by managing expectations can stop virulent inflation or deflation. In response to the BOJ's admission that QE has failed to do just that, RenMac's Neil Dutta noted that they are unlikely to reverse course, as it is better to appear "in control of the ship" rather than being caught "passing at the shuffleboard court." Read next: OECD's William White: Monetary Policy Has Failed and Economists Are Making a "Profound Ontological Error"